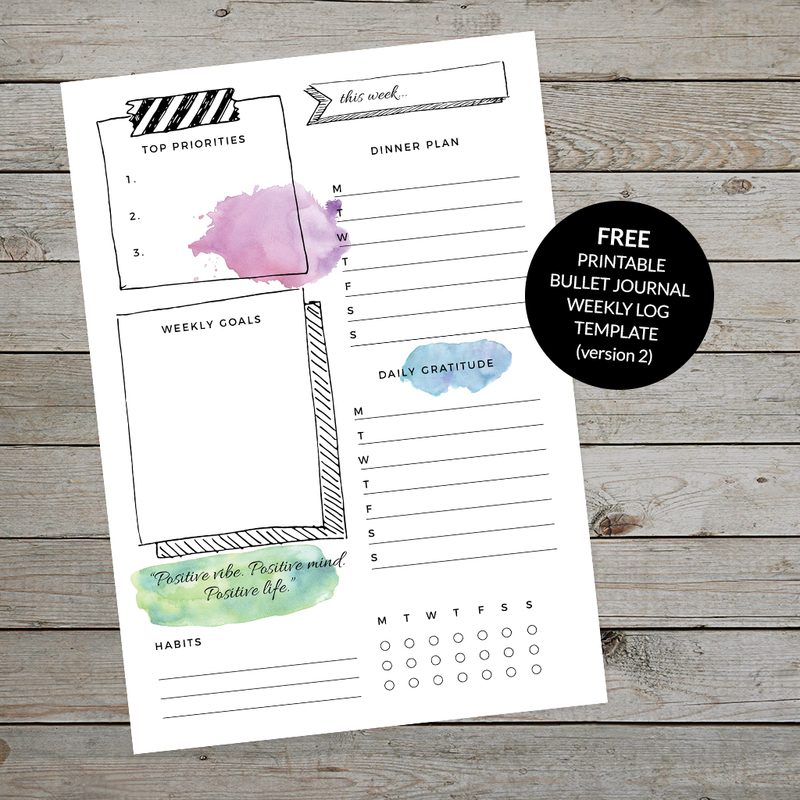 Download a printable Bullet Journal Weekly Log template from my free Planner Lovers Resource Library! Create a weekly log ‘spread’ in your bullet journal by adding the days of the week to the facing page. A completed weekly log in my bullet journal! What tasks or projects are most important this coming week? Knowing your priorities at the beginning of the week will help you write your daily to-do lists with intention. You’ll be more likely to stay on track and focus on the tasks that matter. Come back to your weekly log often and check in with your top priorities as you move through the week. Are you still on track? If not, adjust your daily to-do list to include tasks that line up with your priorities and help you to get more done. Like your weekly priorities, weekly goals give you the direction you need to plan each day with purpose. Breaking down big goals into smaller, achievable, weekly tasks is a great way to stay on track and nail those big goals. Remember to celebrate your wins at the end of every week; you’ll be more motivated to keep moving forward if you do. Are there new habits you would like to establish? Keep it simple and track the most important habits in your weekly log. A habit tracker in your bullet journal acts as a reminder of the important things to include in your daily routine, as well as keeping you accountable. Plus, ticking off completed habits will give you a great sense of achievement! Setting up a weekly dinner plan, ahead of time, has had such a positive impact on my week. Knowing which meals I’m going to cook means I can write a simpler shopping list, in less time, and I only buy what I really need. I can shop for two or three days at a time, saving me time and money. Practising gratitude is one of my favourite, and most effective, happiness habits. It’s also one of the simplest! Creating a small space in your weekly log to record something you are grateful for each day will boost your happiness and remind you to pay more attention to the little things. Often we will discover it’s these little things that actually bring us the most joy – the smell of fresh coffee brewing, a flower blooming in the garden, or the sound of our children giggling. The more mindful you become of these precious moments, the greater the impact a gratitude practice will have on your sense of wellbeing and happiness. If you would like to deepen your gratitude practice, create a separate collection in your notebook and write in more detail about the things you are grateful for. 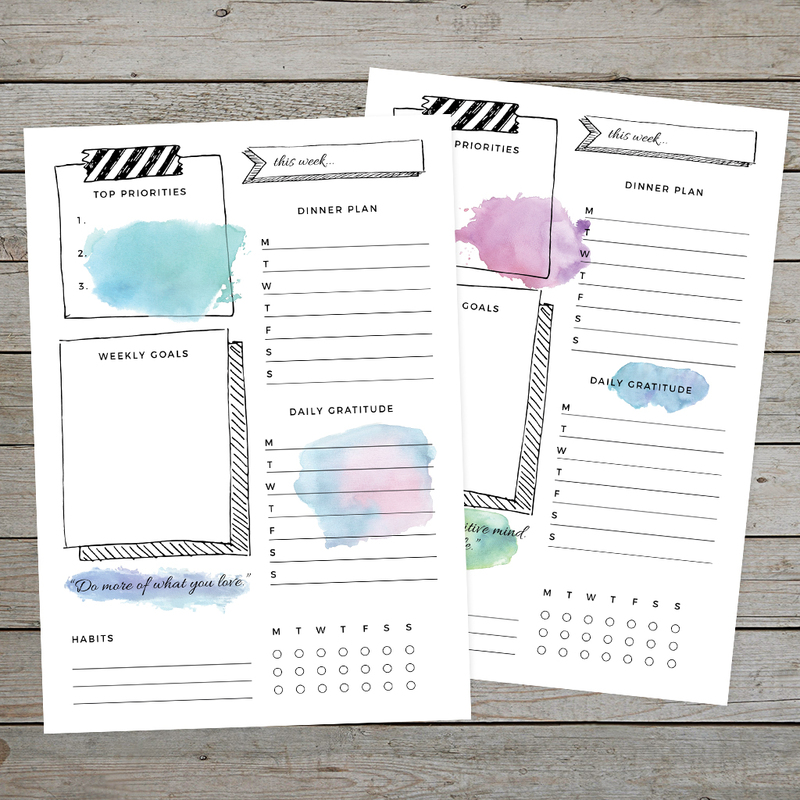 Choose from two printable bullet journal daily log templates – both with splashes of watercolour and an inspiring quote! Two printable designs are included when you download the ‘Watercolour’ Weekly Log from my free Planner Lovers Resource Library. Download your weekly log template from my free Planner Lovers Resource Library. Choose from the ‘watercolour’ design or the black and white design. Both are available as two A5 weekly logs on an A4 document. Print the PDF files at 100%, or smaller to fit your particular page size. Simply cut the A4 sheet in half to create two A5 weekly logs. To use your printed sheet- try sticking the weekly log straight into your notebook page, or use it as a template to hand-draw the design in your journal. If you hand-draw the design, change up the headings to suit your needs! You can also use this weekly log in your ring-bound planners, such as a Filofax or kikki.K. Use a one-hole punch to add holes where required and insert into your planner. Once you have confirmed your email address you will receive an email from me containing a link to the library and the password. If you don’t receive the email, please check your junk folder. Let me know if you have any other questions. Enjoy the printables!